Yet despite making over one hundred films, Ronet would never achieve the iconic celebrity—or notoriety—of Alain Delon, Jean-Claude Brialy, or indeed Jean-Paul Belmondo. In his early twenties he’d caught the eye in Jacques Becker’s Rendez-vous de juillet (1949), as an idealistic student in Paris. Ronet didn’t have the chance to shine, however, until Malle—whom he had met at the 1956 Cannes festival—cast him in Elevator to the Gallows (1957). When he played the glib young man willing to carry out a meticulously planned murder for the sake of his mistress, his controlled talent finally emerged. Six years later, when Malle was preparing for The Fire Within, Ronet lobbied hard to get the role of Alain Leroy. (Malle had rejected Ronet for the romantic lead in 1958’s The Lovers, but he was ideally suited for Leroy.) Diffident, contemplative, and detached from the energy of the entertainment business, Ronet saw in Leroy a mirror image of himself, suffering as he was from a severe drinking problem. Indeed, throughout his life Ronet remained a charmeur, drawn to the “good life” as a moth to a flame. He was married briefly to the stage actress Maria Pacôme in the fifties; he was seriously injured in a car crash during a fling with Jean Seberg in 1967, with the actress behind the wheel; and he spent his final years with Charlie Chaplin’s daughter Josephine, with whom he had a son. Through most of his career, Ronet drifted languidly through a host of supporting roles. Often on-screen his mind seemed to be elsewhere, perhaps with his numerous hobbies—sculpture, painting, writing, photography, music. Like Malle, he did not mix with the Cahiers du cinéma crowd, feeling more at home in luxury bars than on the steps of the Cinémathèque. Ronet, only five years older than Malle, shared with his director a privileged background (his parents were both established actors in the French theater) and an anxiety about the passing of youth. As Malle said once, “I thought I was not young anymore—like Alain Leroy, the character in the book and the screenplay. I was Alain Leroy.” Ronet, in the manner of Leroy, drank too steadily throughout his early years, and when Malle offered him the part in The Fire Within, he was forty pounds overweight (one of the reasons he had lost the role in The Lovers). He and Malle had been used to frequenting clubs in Paris during the early hours of each morning, but now the director imposed a draconian regime, so that on-screen Ronet looked emaciated and drained, reminiscent of Ray Milland after he’s gone cold turkey in The Lost Weekend (1945). “My collaboration with him in the making of the film was far more intimate than I’d ever experienced with any other actor or actress before,” recalled Malle of Ronet. Leroy’s clothes came from the director’s own wardrobe —“the shirts, the suits, the ties, everything. 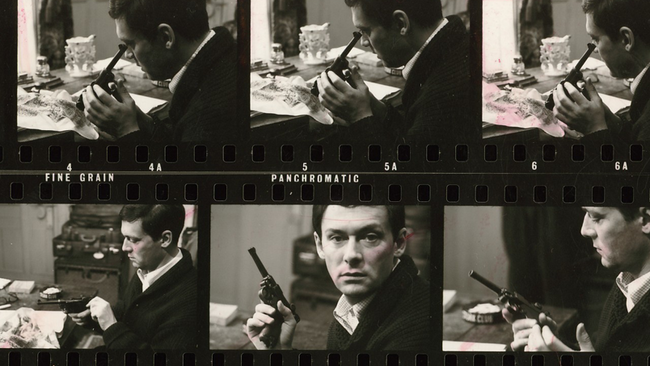 Even the gun was mine.” A photograph of Malle and Ronet together in black tie at the Venice festival underlined the remarkable resemblance between the two men. His eyes reflect his boredom, as well as acedia—that torpor wedded to melancholy and a sheer weariness with life that marked the surrealist poet Jacques Rigaut, the model for Leroy in the book. Those eyes give us eloquent clues to his inner turmoil. For example, when he goes to the restroom in a bistro and exchanges long looks with a boy, it’s as though he’s recalling some homosexual experience from his days as an officer in the Algerian war; Ronet uses his lips subtly to suggest some undeclared discomfort. Leroy smiles rarely, but when he does it’s dazzling, and explains the fact that women give him “some hold on life,” more so than men. His male friends reproach him for being trapped in adolescence, refusing the certainty that comes with adulthood. Former mistresses, however, reassure him. The one woman who might save him, Solange (Alexandra Stewart, who would share Malle’s life for several years), is already wrapped and numbered in a golden bourgeois cage, with a husband as vigilant as a viper. Ronet’s performance renders Leroy more pitiable than he ever was in the novel, because in reality Rigaut had been arrogant and disdained the compassion of his friends and acquaintances. Thanks to Ronet, Malle admitted, many filmgoers identified with Leroy to a degree that he had not anticipated. Perhaps the greatest compliment came from Pierre Drieu La Rochelle’s brother, Jean, who, after seeing the film, wrote Malle a letter, telling him how much Ronet resembled Pierre and his contemporaries in despair. Other directors occasionally saw the talent in Maurice Ronet: Claude Chabrol, for example, used him well in La femme infidèle (1969), as did Jacques Deray in The Swimming Pool (1969), where he played Delon’s rival for the affections of Romy Schneider. Probably the one performance that rivaled his work in The Fire Within was in René Clément’s Plein soleil (1960), made three years prior to the Malle film and a role tailor-made for Ronet’s capricious, irresolute personality. One feels he was in harmony with the perfidious world of Patricia Highsmith, as he would have been with the dissolute antics of F. Scott Fitzgerald, whose The Great Gatsby Leroy reads to the last page before committing suicide in The Fire Within. He also dabbled as a director over the years, with Malle helping to financially rescue his friend’s maiden effort, The Thief of Tibidabo (1964). Peter Cowie is a film historian specializing in European cinema. He has provided commentaries for more than a dozen Criterion titles. His latest book is Louise Brooks: Lulu Forever.